When new, Chevy's Vega was shipped from the factory standing up on rail cars. Today’s Nice Price or Crack Pipe Vega has twin turbos for the twin rotors of its adopted Mazda mill, but you’ll still need to decide if its price makes its seller a stand-up guy. Yesterday’s Hurst Commando was pretty damn rare, seeing as it’s claimed to be one of only 100 of the special editions ever built. That apparently wasn't enough to account for its twenty grand asking, resulting in a narrow but decisive 57% Crack Pipe loss. For $20,000, What’s The Hurst That Could Happen? You know what else is pretty rare these days? Vegas, that’s what. No, not Las Vegas , but Chevy Vegas. Developed under the code name XP-887 and guided by Ed Cole - the very same executive responsible for the Corvair - the Vega was intended to take on both the imports and the new home-built smaller cars from domestic competitors Ford and AMC. But sadly it didn't go as planned, and Cole's design edicts created rifts with the Chevy engineers. Newly elevated to the position of Chevrolet General Manager, John DeLorean attempted to fix the things that were wrong with the XP-887 - issues mostly resulting from Cole’s mandates - but there was only so much that could be done. In the end, the Vega was released in September 1970 with a somewhat flaky corrosion-prone unit-body, and an aluminum engine that, lacking liners, tended to eat itself alive over time. The poorly engineered engine mounting (the mounts spec’d were too soft) made that engine seem course and vibration prone even when it wasn’t ovaling its bores. To top it off, the Vega ended up being almost 10% more expensive than its VW Beetle target, as well as Ford’s Pinto, its direct competition. Unequivocally it was a disaster, but at the very least it was a damn good looking failure. Today’s 1971 Vega Hatch still looks pretty sweet, and this one appears to have stood the test of time, having not returned to its base elements like so many others. It also solves the whole beer can engine issue by having its Chevy four-pot dumped at the recycler and adopting a pressurized Mazda 13B out of an FD RX-7. So equipped, the ad touts the car as something that even Jay Leno doesn't have. Take that, Jay! The 13B-REW now resident under this Vega’s hood is also an engine made of aluminum with its own history of reliability issues. Of course most of those had been worked out by the time this one had its sequential turbos applied, and as you might imagine 250 horsepower can atone for a multitude of sins. Visually, the car has been dressed in skirts that share the body’s virginal white paint. The nose has had its bumper cleaved so that it’s now bumperettes, while inside the dash has been replaced with aftermarket gauges and the space has been fitted with a cage. 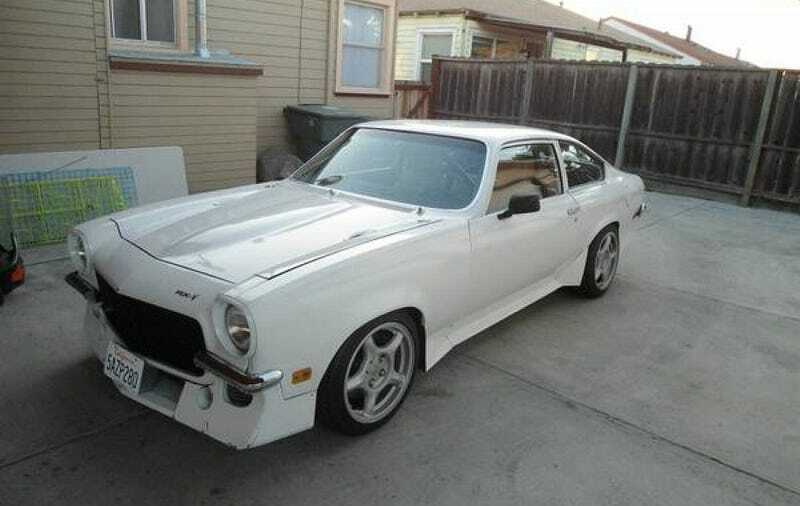 The seller wants $9,100 for this wonderful mashup of Vega and Mazda (Vegzda?) and it's now up to you to say if that's a decent price to be unlike Jay Leno. 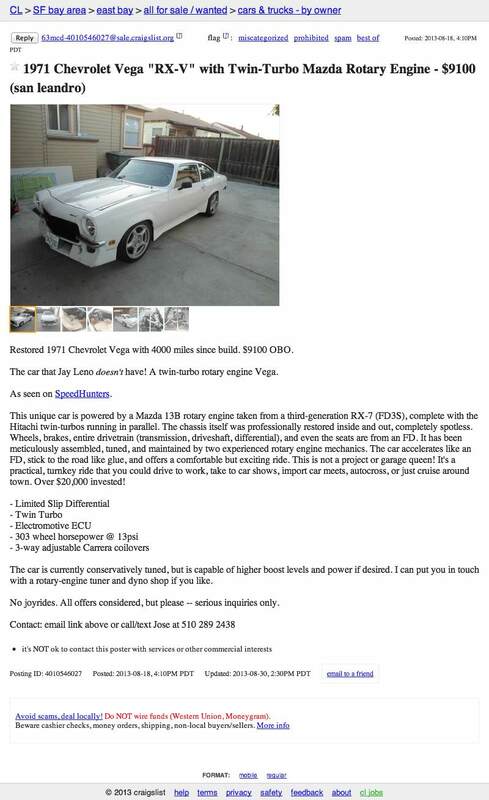 What do you think about this custom rotary Vega for $9,100, does that price seem very nice? Or, would even Leno turn this one down?